Morgan (my brother): I was hoping that wasn’t pepper. No worries, it’s not pepper! =) Apparently, I was “subscribed” to vanilla bean paste on my amazon account and was getting automatic shipments every 3 months. I had 6 bottles in my pantry and so I’ve started looking for ways to use vanilla bean paste…it’s not hard ;). I decided to add some vanilla bean paste to a batch of classic rice krispy treats – soo good! 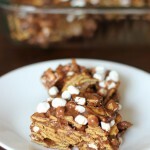 And what’s easier than rice krispy treats?? I even made these in the microwave! 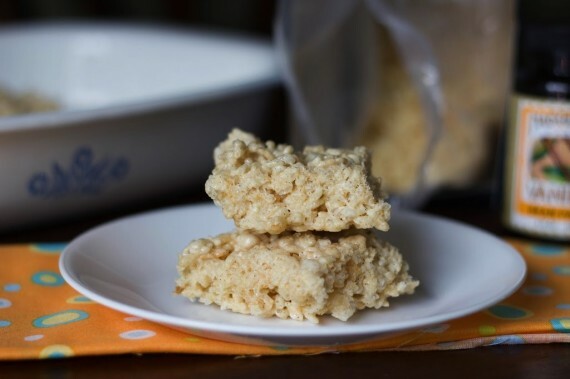 The vanilla bean paste really takes your traditional rice krispy treats to the next level. Enjoy! 1. In large saucepan melt butter over low heat. Add marshmallows and stir until completely melted. Stir in vanilla bean paste. Remove from heat. 3. Using buttered spatula or wax paper evenly press mixture into 13 x 9 x 2-inch pan coated with cooking spray. Cool. Best if served the same day. 1. In microwave-safe bowl heat butter and marshmallows on HIGH for 3 minutes, stirring after 2 minutes. Stir until smooth. Add in vanilla bean paste. Follow steps 2 and 3 above. Microwave cooking times may vary.